A broken water well submersible pump is a disaster for any homeowner. The pump draws fresh and clean water into your home for all of your needs including washing, showering, doing laundry, cooking, and cleaning. Having a working pump is imperative to the function of an out-of-city house. So if your pump breaks you need to know how to get it in working order and how to do it quickly. Replacing your water well submersible pump is not as difficult as the task might seem. With a little elbow grease, an understanding of the tools you need, and the help of another person, replacing your submersible pump and getting fresh water back to your house can be done swiftly. Here’s how. Your water pump is broken and your house is no longer getting fresh water to the tap. The first thing you need to do is either the model and sizing information that was left when the pump was installed. Write down the details so you can quickly get a water pump that is the right power and the right size for your well. If you cannot find this information, have a friend help you gently take the submersible water pump out of your well. This will take time, but carefully pull it up little at a time until you can check the model information documented on the side of the pump. Write the details down. Put the pump back to keep your well-sealed. In the meantime, get jugs of water to use in your home for drinking and washing dishes. If you would like to conserve water, consider using disposable plates and cutlery in the meantime and only wash what you cook with. Treat this water like you would treat it while you are camping. After checking the pipes and wires for damage, access if you need new ones. If you do not, you should consider keeping it. You can attach the new submersible well water pump to the old piping. Using the information you obtained about size and power, purchase a new submersible pump. If you are unsure, buy it in person and show a salesperson your requirements. They can help you locate the proper pump for your well. If you need any new equipment, such as a torque arrestor or piping, pick those up as well. If you do not have the proper wrench or other tools, also buy them. Now that you have everything you need, with your friend’s help as this is a two-or-more person job, take the pump out again. Remove it from the well. If your old piping is okay to use, simply detach the pump. If it is not, remove everything. If you’re old piping is okay to use, simply use a wrench and attach the new pump to the old piping. Make sure you’re wiring lines up and then attach the new wires using heat-shrinking and self-sealing tubing. You will need a torch to do this. Should you need a new torque arrestor, attach it now. With your friend’s help, slowly lower the new pump into the well until it is at the bottom. Reconnect the top of your well and then reattach the well to the house supply line. Afterwards, make sure the well’s power source is good to go. Test your submersible pump and if everything is in order, you’re good to go and have finished the job. If something is amiss, reassess the steps and make sure you didn’t forget to do anything. If your well is under twenty-five feet deep, consider replacing the submersible pump with a jet pump. These are easier to install. Make sure you have shut off power to the well for optimal safety. Ask another friend to help to make the task to go even faster. 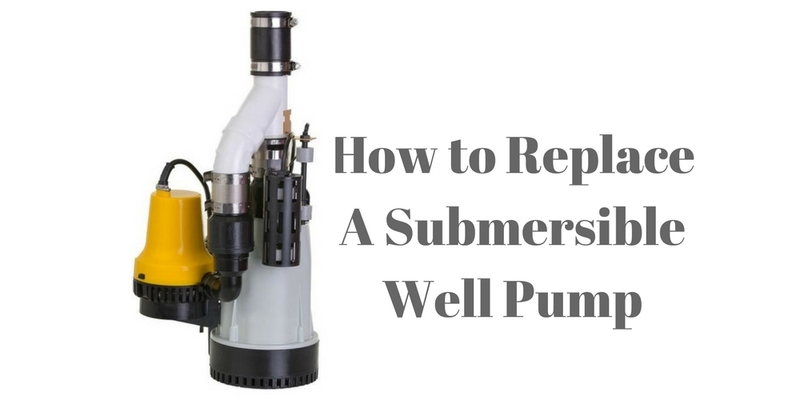 Replacing a submersible pump is not as complicated as it sounds. Simply make sure that you understand what type of piping and pump you need and do not be afraid to ask for help. With these things in mind, you can have the task done in a day.